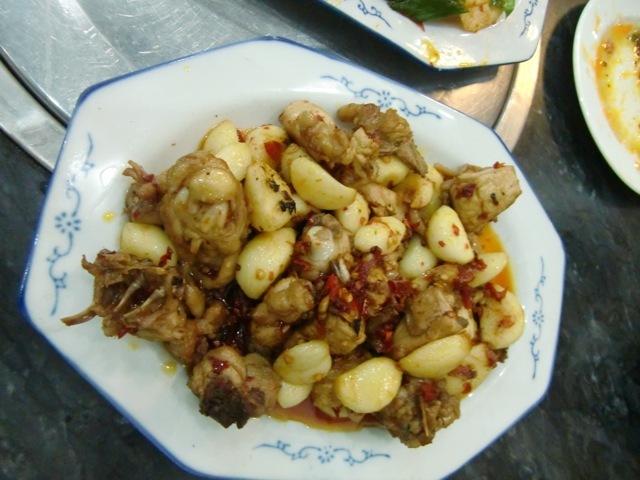 Jul 12 Exciting Miao Food From Guizhou! Awhile ago, my sister sent me an email and recommended trying some Miao place she had found online. It sounded like a great idea so my friend and I did some research and then proceeded to take the subway to get there to save money instead of going in a cab! 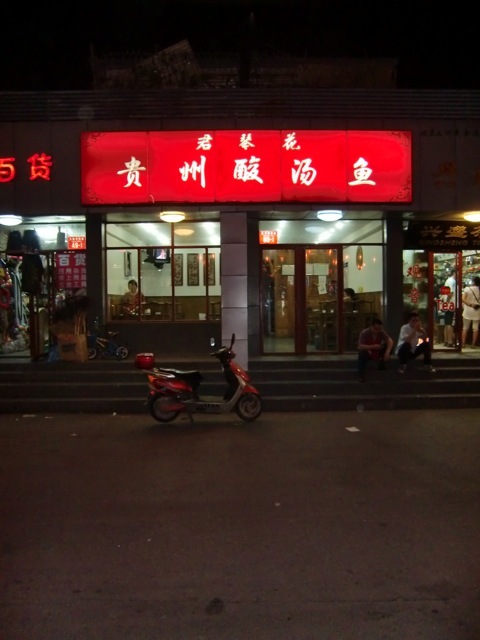 a small Guizhou restaurant on Meishuguan Houjie. The tiny restaurant just had six tables covered with plastic tablecloths, a mish-mash of Guizhou decorations. Their tea had a very special and distinct taste. The boss told us that the tea is imported from Guizhou as are their sauces they use for their food. Their cold noodles were very good! Very spicy! It was delicious. The seasoning was very special. 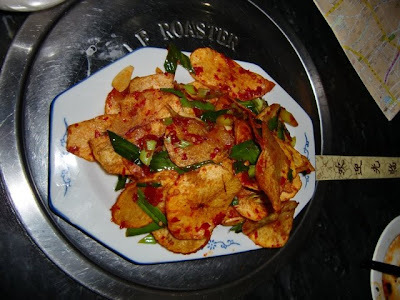 This is their zaola tudou pian, stir-fried potatoes cooked with zaola, a type of crushed chilies popular in Guizhou. 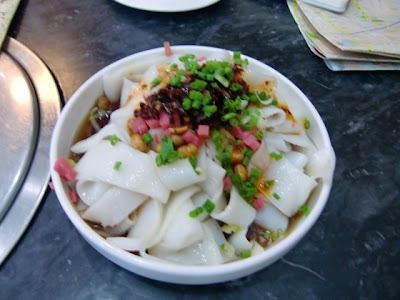 Zaola is Guizhou’s special condiment. According to a review I found online, "The chilies are stone pounded and then allowed to ferment. The thin slices of potato had been passed through oil first, which resulted in a crispy and delicious outer shell, but yet a moist and soft centre." It tasted like the most amazing tasty potato chip ever! Our last dish was a plate of lazi ji with pieces of chicken covered in cloves of garlic and crushed chilies. 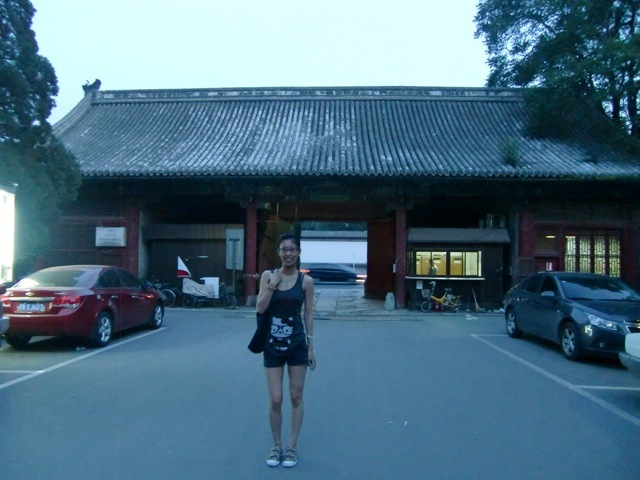 Adventure Miao Food was a success! I love eating at small hole in the wall places because the people are so much more friendly than the big restaurants. Plus, it's cheaper too! The chips were the best dish of the night! Jul 13 Find me on the streets, dawg! Jul 17 Northeastern Chinese Food!